The future tense is perhaps the most simple verb tense to cover since the conjugations are the same for –ar, -er, and –ir endings. In this lesson plan we will investigate future tense usage with regular verbs and introduce the twelve irregular verbs as well. Students will become familiar with future tense conjugations for regular verbs with –ar, -er, and –ir endings. Students will be able to use future tense verbs in a sentence successfully. Students will become familiar with the future tense of twelve irregular verbs. 2. 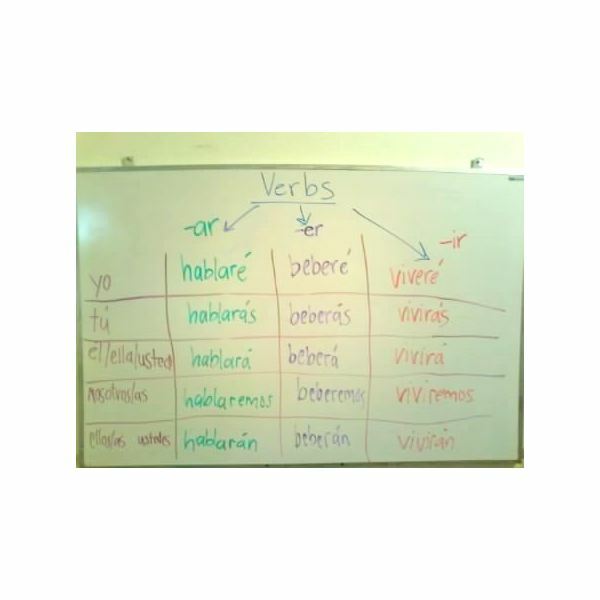 Remind the students of how in Spanish, verbs are conjugated to express tense. Also explain to students that future tense is a bit simpler in that –ar, -er, and –ir endings all are the same: the verb stays the same and letters are added to the end to express future. Create a chart on the board and allow students to copy down in their notebooks. Give an example verb for each. 6. Give students a piece of paper and have them write two things that they will do during the upcoming weekend using the future tense and collect the paper. Collect the papers in which the students wrote what they would do over the weekend. Check for any confusion with future tense. Students should catch on to future tense usage fairly quickly, but it is important not to rush through it. Make sure students have a good handle on the future tense before moving on because the tenses are about to become a bit more complicated!